Manufacturer of a wide range of products which include homogenizer machinery. Our company has gained expertise in the field of manufacture and supply of Homogenizer Machinery. We offer our clients with rigid design homogenizer machinery that is manufactured as per our client’s requirements. 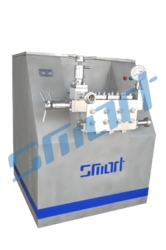 Further, these machineries are in high demand in the market and have high-grade quality raw materials. To add on, these are available at the lowest prices to our customers. Looking for Homogenizer Machinery ?